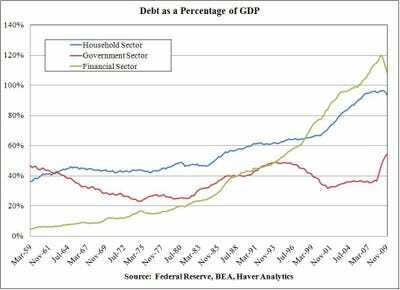 First of all, what this chart shows you is that the consumer is not deleveraging significantly (see Consumer credit down, but does it show deleveraging? and Why is everyone saying consumer credit is falling? It’s not). Sure revolving debt (read: credit card debt) has fallen. But mortgage debt is still sky high. And on a debt to GDP basis, there really isn’t a huge come down. Sorry, but that’s what the data are saying. For an indebted household sector, this is bad news. 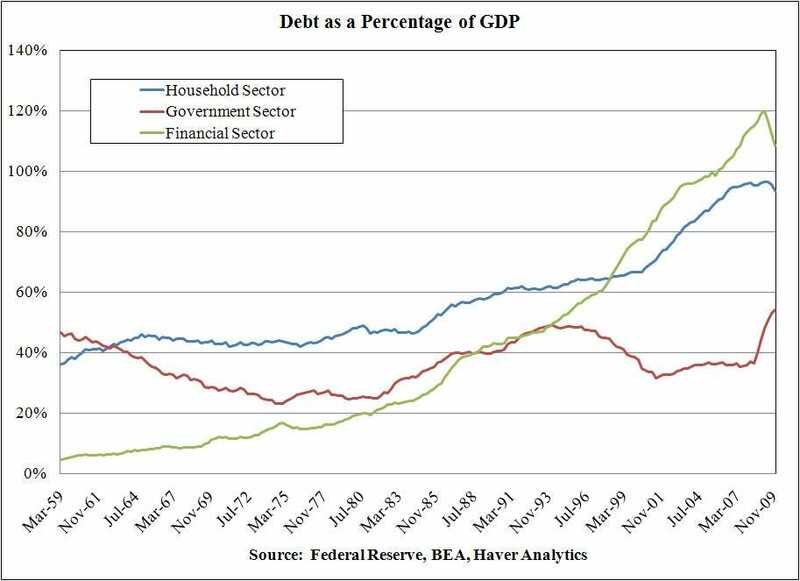 But, then you look at the other sectors and you see that the financial sector is deleveraging in a massive way. When I last looked the data, I concluded that the U.S. economy was wholly dependent on leverage in the financial sector to continue growing. So, the decreased financial sector leverage spells a lower growth future. Finally, the government sector debt load continues to surge upward. Keynesians will tell you that the deficit spending that is the source of this increasing debt load is needed to increase savings in the private sector. However, it appears that most of the savings is being done in the financial sector and not in the household sector where it should be.